Right, where do we begin? Firstly, we should say that the information we have here is from a highly reliable source inside Dell, and that what we're looking at is two leaked roadmaps: one for tablets and one for smartphones, both of which run between now and Q1 2012. Smartphones first, then. 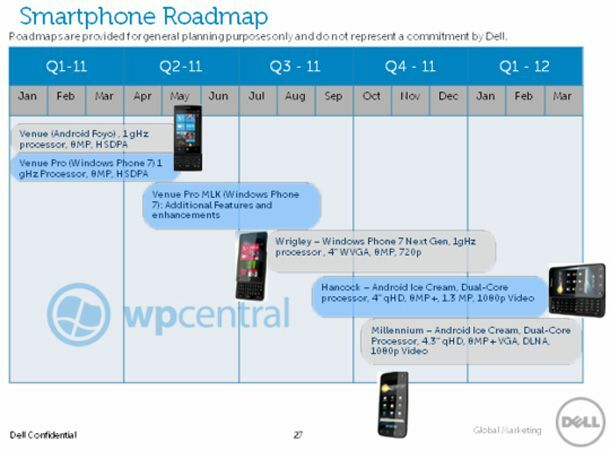 First up – after the Dell Venue Pro, which we already know about – is the Wrigley, a Windows Phone 7 handset due in Q3 2011. It's got a 1GHz processor, a 4-inch WVGA screen and an 8-meg camera. The Millennium is a 4.3-inch device coming in Q4, running Android 2.4 (Ice Cream). The Hancock – due in Q1 next year – will be a very similar beast, although it'll sport a 4-inch display and a slide-out QWERTY keyboard. In terms of tablets, we'll have the already-revealed Streak 7 soon, followed by the Gallo in Q2, which will run Android 3.0 (Honeycomb). We don't know much about it or its Dell Honeycomb brothers, the Opus One and Silver Oak – both coming inQ1 2012. There are two Windows tablets on the way, too. The Rosemont will be out in Q2 this year running Windows 7, while the Peju – destined for Q1 2012, will run on Windows 8.